The efficiency and aesthetics of prefab proved appealing to the owner of this Dwell Home, built on a rugged island off Canada’s western coast. 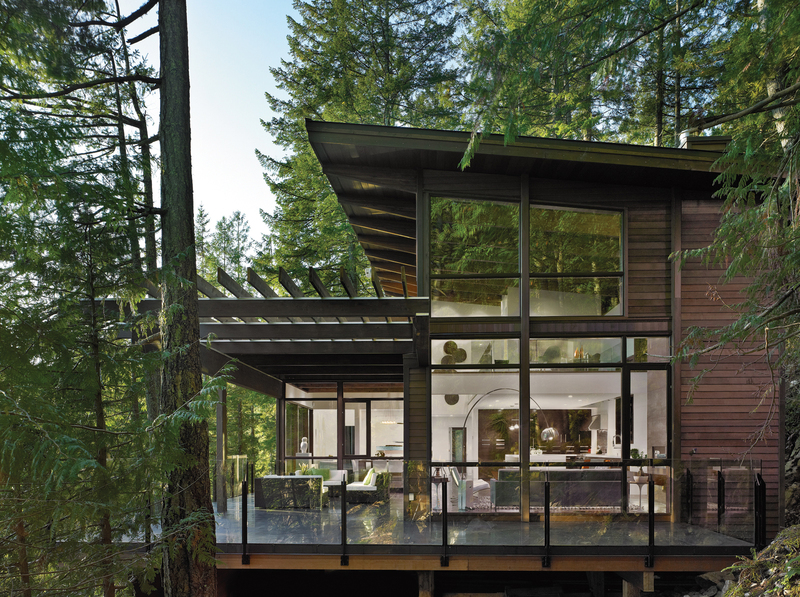 When Johnny Bellas set out to construct his dream home on British Columbia’s Gambier Island, he knew that building prefab would clear the logistic hurdles his plot of land posed. The qualities that made it desirable—a steep slope draped in trees overlooking a waterfront panorama of Howe Sound—are also a builder’s nightmare. However, Bellas was confident that Lindal’s TD3 2490 model, part of the Dwell Homes Collection, would rise to the challenge. He fell in love with its mid-century sensibilities, great room with soaring 18-foot-high ceilings, ample natural light, and rustic facade that blends in with its surroundings. With the help of local firm My House Design/Build/Team, Bellas customized the interior finishes and furnished it with reissues of design classics.